A new sports car from Jaguar, the iconic British brand that has sports cars built into its 'DNA' like few others, is something that needs to be trumpeted out loud. Fortunately, the publicity machine, aided and abetted by automotive media (including Next Car) ensured that the entire world - well almost - would read about this new masterpiece from Jaguar. It would be called F-TYPE! The anticipation of the new car's arrival was destined to be an exciting time for all those who got to see the new car - even more so for those who experienced it on the road. The Jaguar F-TYPE seems like a continuing story based on the famous E-TYPE of the 1960s. Of course, the E-TYPE itself was a continuation of the brilliance of previous sports cars. Did I hear some-one say D-TYPE? So the lineage continues. But the new F-TYPE is nothing like the classic E-TYPE. No apology needed, because the car market has moved on over the decades. A 21st century E-TYPE would be good to see, but a modern day clean sheet design is always going to be the way to go for the Jaguar brand. 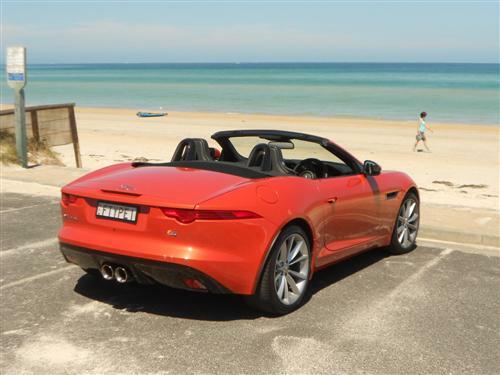 Hence, the new F-TYPE takes on the role of a more sophisticated car than that of decades ago. Long live the E-TYPE I say, but welcome to the new F-TYPE complete with an exciting visual effect, thrilling engine choices and a brilliant heritage that requires not one word of justification. 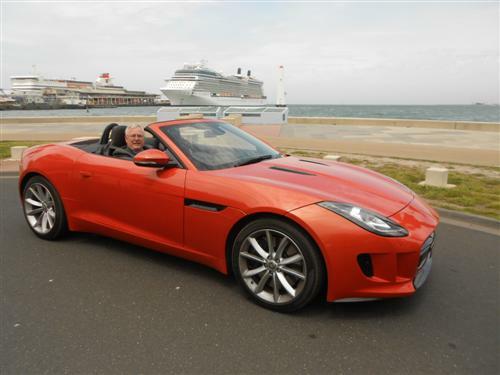 Let's drive the new Jaguar F-TYPE. 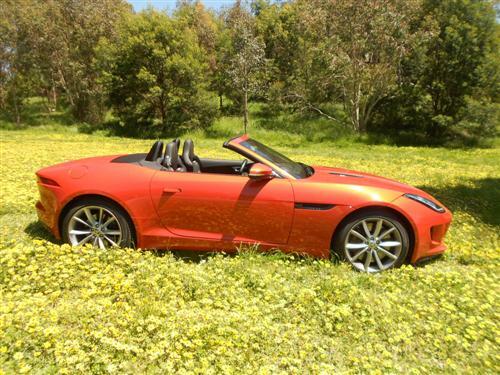 The Jaguar Australia supplied test car came in what is a must see colour, known as Firesand. This optional colour is, I believe, the most attractive colour available and it will enhance any driveway or highway. 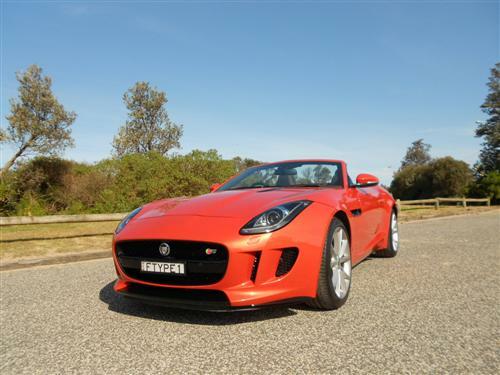 Our test car was the Jaguar F-TYPE S. This means it was the mid-spec model, powered by a V6 supercharged engine. Our test car came with numerous options of the worthwhile variety and some that can be passed aside at the time of ordering your own F-TYPE. 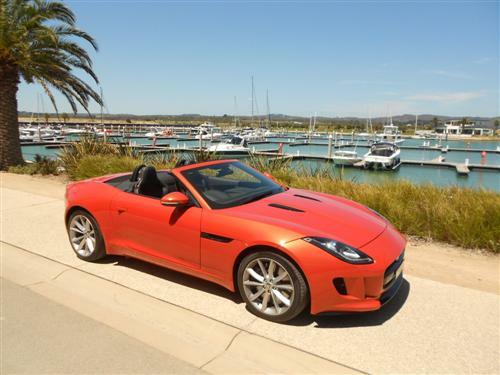 The starting price* for the F-TYPE V6 S is $171,045*. A lot of money for a two seater. 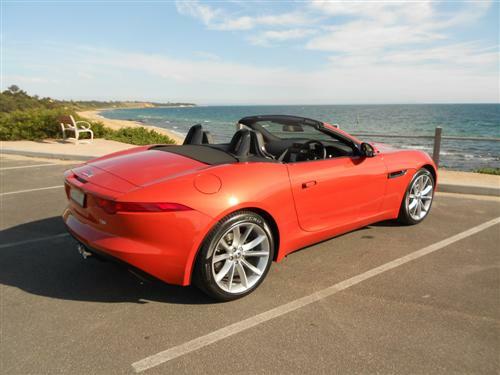 But given that the F-TYPE is a quality premium sports car I suggest that, if anything, it may be priced a little low. But then Jaguar is recognised as offering good value - you only need to check-out the XF to recognise that! Therefore, the test car had a price* of $205,480* - and worth every cent of it! Three versions of the Jaguar F-TYPE are on offer. 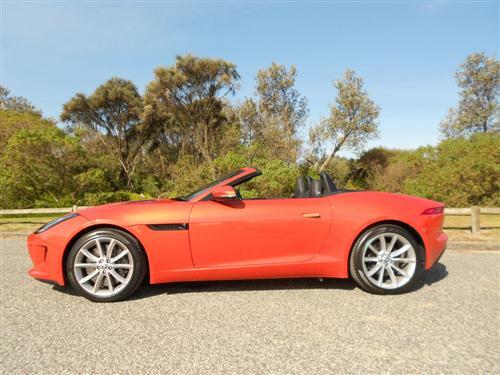 As we indicated on the 1st August 2013, when choosing your F-TYPE you simply select 0-100 km/h in 5.3 seconds or 0-100 in 4.9 seconds or 0-100 in 4.3 seconds. It is your choice. The three models are, respectively, F-TYPE, F-TYPE S and F-TYPE V8 S.
Without doubt, you will be popular if you drive an F-TYPE. We discovered that on numerous occasions as we ventured out and about. Make no doubt, the new Jag sports car is all about enjoying the chore of driving. Just getting into the car is enough to put a smile on the dial. With a happy disposition and a Jaguar wrapped around you then setting off on your motoring adventure or commute is always going to be a thrill. The exhaust note is more discreet than raucous. The ride is adequately firm and the driving dynamics confirm you are always going to enjoy responsible motoring in this car. The steering and braking are superb! As a reminder, we reiterate the F-TYPE S covers a 0 to 100 km/h dash in as little as 4.9 seconds if you are so inclined to put your foot down. You can't get a thrill a minute when the 0-100 takes just 4.9 seconds! But what an amazing quality for a car to have quoted amongst its credentials. The Jaguar F-TYPE is low slung, so precautions such as angling the car and reducing your speed is required at speed bumps, driveways and sharply angled approaches/departure areas such as ferries and the other restrictive access points. Overall, the driving aspects have to be rated as civilised, which is an important aspect if you are to enjoy the car during 'everyday' conditions or those week-end joy rides. 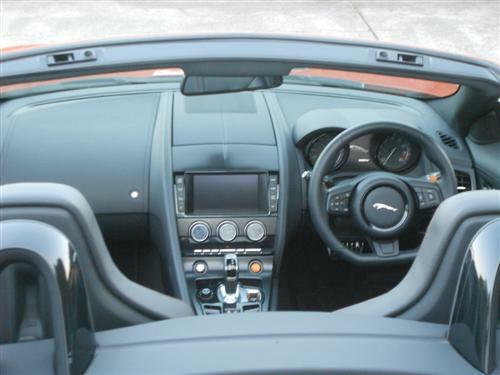 There is one thing that is immediately recognised when you get in an F-TYPE - and that is that there is just enough room for the driver and one passenger. As appealing as this Jaguar is, it has to be accepted that you will not be burdened with too much space. The comfort level is quite good for two occupants. But the occupants should not expect carry-on luggage (if we can call it that) to be easily accommodated. There is no room behind the front seats and the door pockets are small. 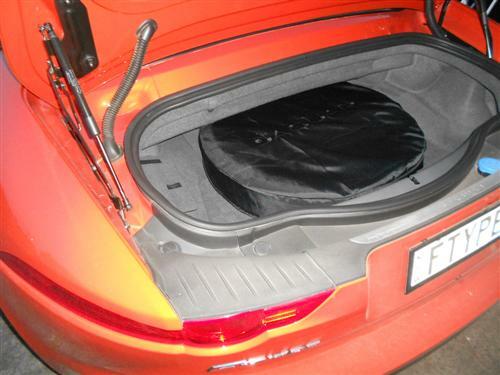 With two occupants on board, an attaché case and/or large handbag will need to go into the small boot which is dominated by the centrally positioned spare wheel. 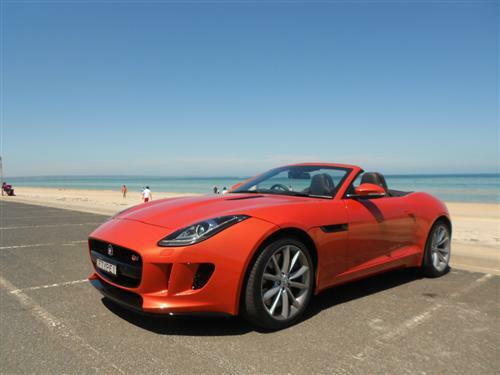 But we recognise that compromises can be made when you drive something as nice as the new F-TYPE. If you need a big boot, then you may prefer a Range Rover. We motored around quite well during our week in the car without making a fuss about the inability to fit more than a camera and a diary in the cabin. In the 'S', the partially electrically adjustable seats have leather facings. 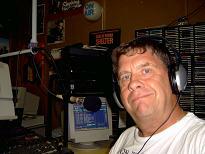 Be assured, the seating was always comfortable and from my perspective entry and egress was easier than anticipated. I found the eye-catching contrast stitching in the test car quite appealing. Twin cup-holders and a four-way adjustable steering wheel makes for a comfortable environment for each occupant. The electric parking brake eliminates the necessity of a handbrake lever in the cabin - a great feature. Next Car experienced the car with a good mix of top up and top down. My longest single drive was from Melbourne's southern bayside suburbs down the Mornington Peninsula to Rye, about 70 kilometres away. The outward bound trip was with the top down, whilst the return trip was with the top up. The obvious lack of scuttle shake, a haunting feature of many convertibles over the years, was particularly pleasing. Another attribute was the impressive fit of the soft top. Its operation could not have been easier. Wind noise over the top was not over the top either. 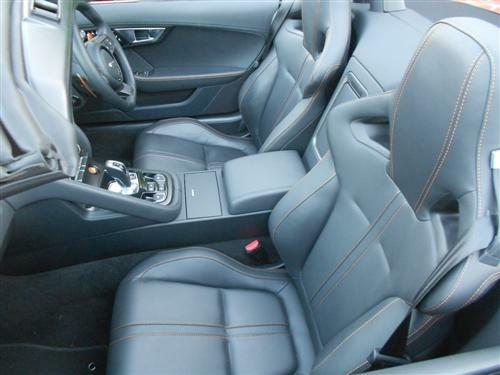 As shown in the accompanying images, the soft top folds away rather neatly. It is electrically operated. Driving with the top down is a great feeling. With my comb-over it is difficult to get that prized wind in the hair effect. But be assured it is good for the mind to have an open top drive. Whilst out and about, a teenager said to me "Nice car, Mister", I spontaneously responded "Yes, but Confucius say old man with comb-over and summer sun not good combination with sports car". After a further brief period of pleasant banter it hit me that even the Melbourne summer requires head gear for those who are follicly challenged. As always, when exposed to the sun adequate precautions need to be taken so that the enjoyment doesn't turn sour. The Jaguar F-TYPE stands out. When I pulled into a crowded beachside car park I U-turned alongside a group of four or five families having a bbq in the adjoining park. The head chef was quite close to the tarmac and very kindly invited me to park the car and join them for lunch. I'm sure the car was the attraction, rather than me! As I had already had my all-day breakfast for lunch, I respectfully declined and I continued on searching for a good photographic location. But the chance meeting with such warm and friendly folks did further highlight the obvious fact that the new F-TYPE is an extremely desirable machine. Just 3-litres of supercharged efficiency gets the F-TYPE S going. Power is rated at 280kW at 6,500 rpm and torque comes in at 460Nm at 3,500 to 5,000 rpm. Nineteen-inch 'propeller' alloy wheels are standard, as per the test car. Various 19" and 20" wheels are available from the extensive options list. Dynamic stability control; anti-lock braking system; electronic brake distribution; front and side airbags are all standard. So, too, is a reversing camera and roll-over bars. 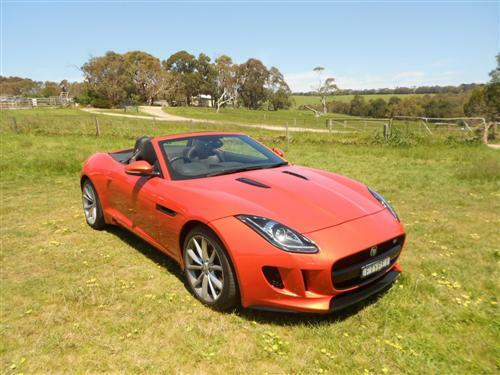 Consumption for the F-TYPE S is rated at 9.1 litres/100 kilometres. The urban consumption is rated at 12.8 litres/100 kms. The on-board trip computer indicated our consumption was 10 litres per 100 kilometres. We were happy with that as our driving was almost all urban traffic conditions - a mix of highway and local streets - sometimes in heavily congested circumstances. CO2 emissions rating is 213 grammes/kilometre on the 'combined cycle' for the 'S'. An eight inch screen with navigation and the all important Bluetooth, USB and AUX connectivity are standard. As is the ten-speaker sound system that includes a singe disc CD player. Three year/unlimited kilometre warranty is featured and roadside assistance is available for the length of the warranty (conditions apply). A great feature is the inclusion of scheduled servicing for three years or 100,000 kilometres for the F-TYPE (conditions apply). No price servicing sure beats capped price servicing! Jaguar's new sports car is a particularly welcome addition to the world of motoring. 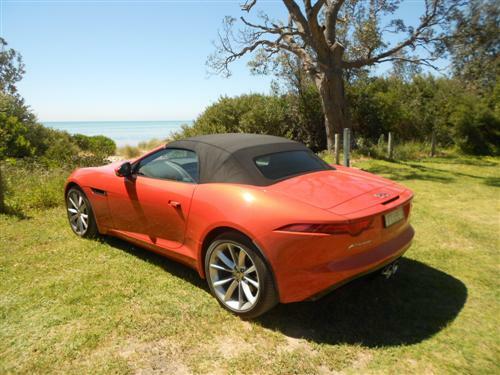 If two seat motoring is on your radar, then the F-TYPE S offers an exceptional experience equating to emphatic enjoyment day after day after day.